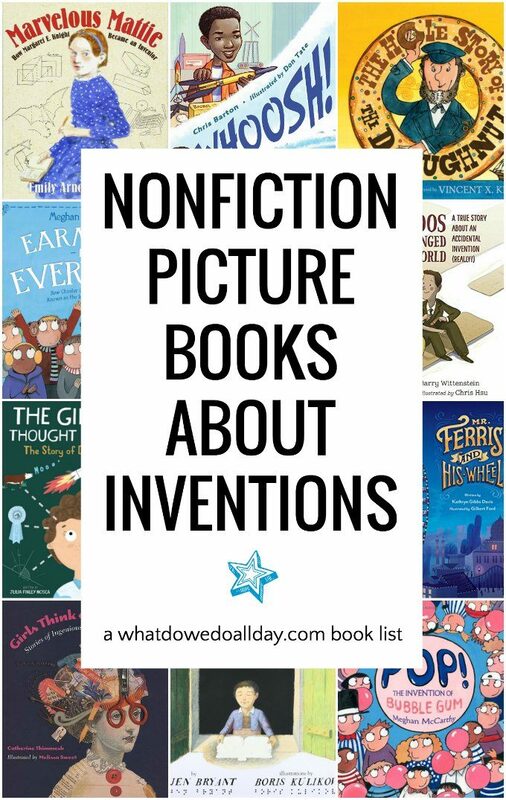 Nonfiction Books about Inventions and their Amazing Inventors! For kids with curious minds (that’s all the kids in the world), few things are more inspiring than stories of people who invented fascinating products and machines. 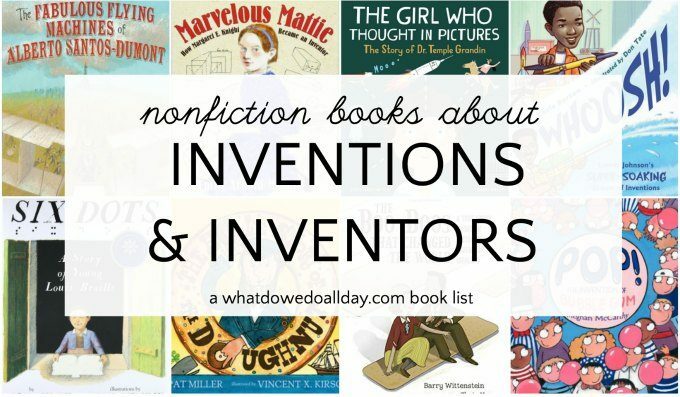 These nonfiction books about inventions will fill your children’s heads full of marvelous facts and then get them off the couch to try their hand at their own inventions. They are also excellent books to teach kids about STEM and STEAM subjects! Pop! : The Invention of Bubble Gum by Meghan McCarthy. This is a fun look at how bubble gum was invented by Walter Diemer, an accountant who worked at a candy factory. Very colorful illustrations move the story along and kids will feel the thrill of finally succeeding after working towards a goal. Ages 5 and up. The Girl Who Thought in Pictures: The Story of Dr. Temple Grandin by Julia Finley Mosca. A lovely book written in rhyme about how Grandin’s differences are actually her strengths. When traditional education cannot adapt to Grandin, she finds her place on a farm where her inventions help build better farms and improve the lives of animals. Ages 5 and up. The Hole Story of the Doughnut by Pat Miller. Who doesn’t love doughnuts? And have you ever wondered why they have that curious hole, I mean who would take away part of that deliciousness? Well now you can find out by reading about how sailor Hanson Crockett Gregory determined the hole is a necessary ingredient! Ages 5 and up. Whoosh! : Lonnie Johnson’s Super-Soaking Stream of Inventions by Chris Barton. Kids will love to learn how their favorite Super-Soaker toy was invented! The may also be surprised it was invented by a man who had a career at NASA. Ages 5 and up. Marvelous Mattie: How Margaret E. Knight Became an Inventor by Emily Arnold McCully. Mattie, the first U.S. woman to obtain a patent, started inventing things when she was just a girl. She figured out how to make faster sleds, better kites and when she was twelve, she invented a device to protect loom workers. She also invented a machine to manufacture paper bags. The illustrations in this book are wonderful. Flowing watercolors are accompanied by blueprint like drawings of Mattie’s inventions. Mr. Ferris and His Wheel by Kathryn Gibbs Davis. This is a fascinating look at how an engineer defied gravity to create the iconic Ferris Wheel. The illustrations are simply fantastic and the text effectively combines a compelling and rather suspenseful narrative with historical facts about the invention. Ages 5 and up. MORE: See all our nonfiction book lists! Six Dots: A Story of Young Louis Braille by Jen Bryant. Inventions are not always about mixing concoctions in a lab. This is the interesting story, written in first-person narrative, that looks at Braille’s childhood, how he lost his sight and how he invented a reading system for the blind. Ages 5 and up. The Boo-Boos that Changed the World by Barry Wittenstein. What do you do when your wife keeps injuring herself? Well, you work on figuring out an easy way for her to bandage her wounds, of course! I’ve always found it cute that kids have a love affair with band-aids, and they will enjoy this story in which the Boy Scouts of America play a crucial role! Ages 5 and up. Girls Think of Everything: Stories of Ingenious Inventions by Women is a fascinating collection of stories about women you’ve never heard of and their inventions that you may or may not be familiar with. Ages 8 and up. Earmuffs for Everyone! : How Chester Greenwood Became Known as the Inventor of Earmuffs by Meghan McCarthy. Books about inventions are not always about things that WOW. Someone had to invent the earmuff, right? Chester Greenwood was not a fan of cold ears brought on by the Maine winters and so he set out to do something about it, developing the earmuff and patenting it by the time he was only nineteen years old! Ages 5 and up. The Fabulous Flying Machines of Alberto Santos-Dumont by Victoria Griffith. A really fun book to read aloud! You may have heard of the Wright brothers, but do you know about Alberto Santos-Dumon? He was a Brazilian inventor who flew his own self-propelled plane over Paris. Highly recommended for kids ages 5 and up. See the master index of all our 200+ book lists!